The Goplus magnetic rower is an entry-level fitness machine made for home use only. Although it’s a rather new product available since 2017, it continues to benefit from 5-star reviews from users, as it offers excellent value for the price. It’s similar in specs, design, and resistance system to the Velocity CHR-2001 and the Sunny SF-RW5515. So, if you’re looking for an affordable rowing machine, here’s what the Goplus model can offer. The Goplus magnetic rowing machine features an all-steel frame, but despite its steel construction, it’s not an extremely heavy unit. With the frame fully assembled it weighs only approx. 49 lbs (22.2 kg). Thus, it can be easily assembled and carried by one person. Its front base is equipped with transport wheels which also facilitate its relocation. The guards of the internal elements, as well as several other protective parts, are made of hard plastic. However, they don’t affect the overall sturdiness of the machine. And when it comes to that, the Goplus rower can support users up to 220 lbs (100 kg). Compared to other rowers in this specs range, the Goplus model isn’t extremely large either. However, it does take 70″L x 21″W (178 x 53 cm) of floor space when the rail is fully extended. This being said, it can accommodate users up to 6’5″ (195 cm). On the other hand, the rail with the seat can be folded and locked in upright position. So, with the rail folded up, the machine’s length is reduced to roughly 1/3, offering better storage possibilities. The machine’s rail is not horizontal. It’s slightly oblique, with the lower end given by its connection point to the front part of the frame. This can be a plus, though, as the recovery motion is completed faster, while the user benefits from a slightly better workout for the legs. The seat is built on a durable metallic frame. It integrates three sets of heavy-duty wheels equipped with sealed ball bearings for smooth operation and a long lifespan. Its top is made of high-density foam, featuring a contoured design with a non-slip surface. It’s fairly large, its dimensions being 10″D x 14″W (25.5 x 35.5 cm), which results in an excellent stability and support. At its highest point, the seat is about 10″ (25.5 cm) above floor level. Therefore, entry and exit shouldn’t be too difficult, even for users with disabilities. The Goplus magnetic folding rowing machine is equipped with a set of pivoting pedals, similar to the Sunny SF-RW5624 rower. This means that you can slightly adjust the position of your feet with every stroke, which results in less stress on the ankles. 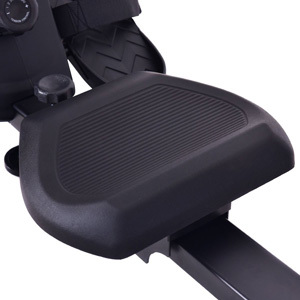 The pedals are made of durable ABS material; they’re equipped with velcro straps and feature small heel guards providing excellent foot stability during your workout. The pulling handle is a simple, straight bar, featuring thick foam grips to reduce the impact on the hands and provide optimal comfort. It’s attached to a heavy-duty nylon strap, not a chain, as the Concept2 Model D trainer; this means it generates less noise during usage, and also doesn’t require lubrication. Last but not least, this rowing machine features a rust-resistant and corrosion resistant paint finish. The color used is black for all the external parts, this being the only color available for this unit. 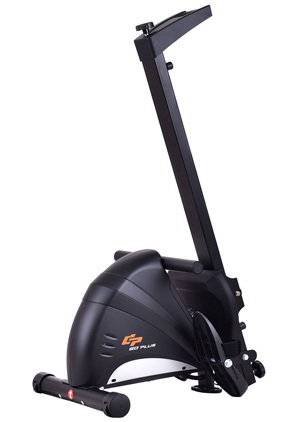 The Goplus rowing machine features a manual magnetic resistance system. This means you don’t have to connect it to a power source to make resistance available. The console is battery-powered and has no control over the machine’s resistance. The rower’s resistance system consists of a small magnetic brake attached to the resistance knob placed on top of the front part through a steel wire. When you turn the knob clockwise, the magnetic brake pad comes closer to the flywheel and generates more resistance. Conversely, by turning the knob counterclockwise, the space between the brake pad and the flywheel is widened which results in less drag and less resistance. 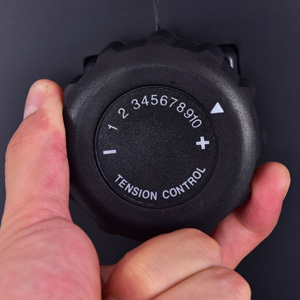 There are 10 levels specified on the rower’s tension dial. The 1-3 levels generate a light resistance, while the 8-10 resistance settings offer the possibility to undertake a bit of a challenge. But as a general idea, this rower does not offer the challenge of a professional rower. Users have reported that the maximum resistance can be compared to pulling approx. 10-15 lbs on a pulley machine. This should be enough, though, to provide a consistent, full-body cardio workout. The unit’s flywheel is not extremely heavy. It weighs 6.6 lbs (~3 kg). It’s perimeter weighted, though, which enables it to generate a consistent momentum and a steady motion. However, considering that this rowing machine does not have a fan, nor does it have a water tank as main resistance elements, it doesn’t generate a dynamic response when rowing. In other words, the resistance doesn’t vary with how fast and hard you pull. It’s solely given by the selected tension level. This is not entirely a downside; you’ll definitely get a good workout on this machine, but a professional athlete may require a dynamic response for their training, to avoid developing bad habits and to benefit from a motion as close as possible to rowing a real boat. 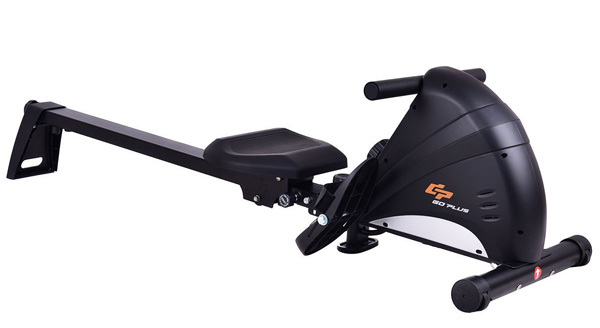 The Goplus magnetic rowing machine is equipped with a basic ergometer. It has a ~3.5″ LCD display, with large digits, being easy to view and read. It tracks your strokes per minute, total strokes, time, and calories. It doesn’t have a pulse reading function. Also, it doesn’t offer the possibility to input personal data, such as age or weight; therefore, the calories burned reading is based only on the stroke count, so it’s not extremely accurate. But it’s still a fair estimation of your workout, good enough to keep you motivated. The meter is easy to use. Its display shows count at the top and the other metrics at the bottom. It only has one button so by pressing it repeatedly you can swap between the metrics that are shown in the bottom section. Or, you can select the SCAN function, which rotates these metrics, showing each one for several seconds. Also, by pressing and holding the button for several seconds you can reset all the metrics to zero. The meter is not programmable. It doesn’t have preset workouts in its memory. It also doesn’t have countdown functions for any of the metrics. As we’ve mentioned above, the ergometer is battery-powered, and the batteries are included. 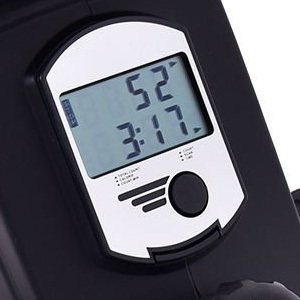 It starts up when it detects activity on the machine; it also has a sleep function which is initiated after several minutes of inactivity on the rower, to save battery life. The front part of the machine which integrates the flywheel, resistance elements, pulleys, pulling handle, and meter, comes fully assembled. All you have to do is attach the rail to the front part, add the seat, the back stabilizer, the front stabilizer, and the pedals. This shouldn’t take more than 30 minutes. The manual provides pretty clear assembly instructions, and basic tools are included with the unit. Maintenance doesn’t require much. It’s recommended, though, to periodically check the for loose bolts, keep the rail clean to prevent any damage to the seat’s wheels, and keep liquids away from the meter. Calories reading is not too accurate. The Goplus rowing machine is equipped with a manual-magnetic resistance system, offering 10 tension levels, and a folding, durable, all-steel frame. Its construction is quite sturdy, being able to support users up to 220 lbs. Even though it’s a budget rower, it does come with a fitness meter which keeps track of your strokes, workout time, and calories burned. It’s a machine for beginners and intermediate users, great for light to medium cardio workouts, recovery training, muscle toning and weight loss. 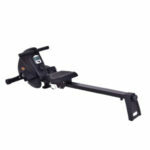 In all, it’s an excellent rower for home use, offering excellent value for the price.